Sherlock 2 news: I’m out. Stephen Fry as Mycroft? Excellent. 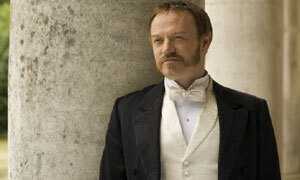 And, (fanfare please) Jared Harris is Moriarty! Ok, ok, just because I don’t know who the guy is (he’s apparently on Mad Men, and is Richard Harris’ son?) doesn’t mean he won’t do a good job. But I really do think that for a villain of Moriarty’s caliber, especially opposite an actor as charismatic as Robert Downey, Jr., an A-list name would have been appropriate, and perhaps even necessary. How do you go from discussing Daniel Day-Lewis to some guy most people have never even heard of? There’s a lot of ground covered in there. Gary Oldman was busy? Congrats to Mr. Harris, really, I’m sure he’s a fine actor, but this does not instill any hope in me. Not that I had all that much before, given that the first movie was largely a disappointment, but I am even less inclined to see the sequel now than when I woke up this morning. And really, I mean, who is this guy going to bring in? Mad Men fans? I’m not belittling the show (my husband likes it) but c’mon, people. And Stephen Fry isn’t even confirmed. Sherlock Holmes FAIL. The best (and sometimes worst) of what’s around: Weekend edition. For today’s Friday post, I’m going to try something different. Part of what I wanted to do with this movie blog was read more reviews, and that’s something that I haven’t really done a lot of. I have my favorites, and I like to read reviews of things I’m interested in, or, conversely, things that get really bad reviews (because those are funny). However, those habits don’t necessarily make for interesting reading. And so, an idea. Inspired in part by RTM’s “Everybody’s Chattin” posts, but hopefully different enough to not make me totally lame, here’s what I propose. Because there are lots of movies that come out that I have zero interest in seeing, I often don’t have a lot to say about them. So, on Fridays, instead of merely pointing out what is available, I’m going to pick a few reviews, and post them here for you! They might be good, they might be bad. I like reading reviews usually on their own merit: it’s very seldom that I allow one determine my preferences for me, and usually only if I’m already leaning towards seeing something and one of my favorite reviewers also has really good things to say about it. Today will be a trial run. Please tell me if you think it’s an interesting idea or not! Kenneth Turan (LA Times) reviews Wall Street: Money Never Sleeps. Speaking of Pajiba, TK has good things to say about Buried. And finally, Stephen Holden (NY Times) looks at Waiting for Superman, which may be the only one of these I might be interested in seeing at some point. Any of these float your boat? I will probably not be watching anything this weekend, as we have some non-movie-viewing activities planned, but I do have Miss Pettigrew Lives for a Day waiting at home (Mark Strong!) so I’ll get to that eventually…happy weekend, all! Chalk another one up for literary staple turned teen movie. With an excellent lead, a strong supporting cast, some solid, non-dated humor, and several nods to the classics of the genre, Easy A is a worthy addition to both unconventional adaptations and to teen movies. Loosely based, but less loosely than a lot of things these days, on The Scarlet Letter by Nathaniel Hawthorne, Easy A is about the travails of an “anonymous” high schooler, Olive (Emma Stone, outstanding) who, after an overheard embellishment regarding the events of her weekend, is suddenly the star attraction of her school’s gossip mill. Olive tells Rhiannon (Aly Michalka, loopy), her best friend, that she slept with a college boy, when in fact there is no boy at all. She is overheard by Marianne (Amanda Bynes, channeling Mandy Moore in Saved), who proceeds to spread the story all over the school and to persecute Olive (along with her team of evangelists) in the name of saving her soul. Inspired by The Scarlet Letter, which they’re studying in English class, Olive decides to embrace her new-found notoriety, and she even enjoys it for a little while. But when a gay student convinces her to “help him fit in” by staging a sexual encounter at a party, things start to get out of hand. Olive becomes the savior of put-upon boys, pretending to sleep with them in order to pump up their reputations in exchange for gift certificates, at the sake of her own, already tarnished, standing. Things come to a head when she is blamed for another student’s (Marianne’s boyfriend, played by Cam Gigandet) chlamydia. The persecution goes into overdrive, and Olive decides she has had enough, so she finally puts herself first in order to rectify the situation. I’ll put her first, too: Emma Stone. Tremendous. She carries this movie easily, with her snarky delivery and easy manner. There have been comparisons, I think, to Juno, but this is a superior performance, not the least of which because the script and dialogue pulls off depicting teenagers without resorting to fabricated slang. Supporting cast: Not relied upon heavily, but very strong indeed. Michalka and Bynes are very broadly drawn, but they work well within the framework of the story. Olive’s zany but caring parents (Stanley Tucci and Patricia Clarkson) are mostly played for laughs, but with these fantastic actors behind the laughs, you better believe they’re good. I want them for my parents. Thomas Hayden Church as Olive’s favorite teacher, and Lisa Kudrow as his guidance counselor wife are both underused, I think, but again, as excellent actors, they do their jobs well. Finally, there’s Penn Badgely as a potential (real) love interest, charming but unremarkable, and Malcolm McDowell as the principal gets one scene in which to do what he does best, which is be crazy/creepy. The humor, as stated, really worked. It tread the fine line between embracing and acknowledging teenager-dom and poking fun at it. 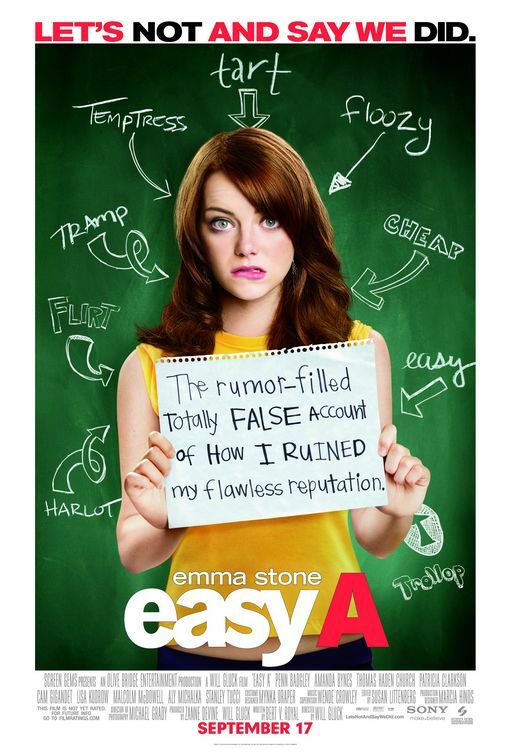 Handling topics like the double standards of gender roles and sexuality, student/teacher relationships and religion is nothing new in movies, but for the most part, Easy A treats them with just enough humor to keep the mood light, but with enough sarcasm and/or gravity to remind us that they are (or can be) issues that society faces. Last, but not least, I loved that the movie’s creators, knowing full well they would be compared to everything that came before, chose to go their audience one further, and incorporated the canon of teen movies into the storyline. There are visual and musical cues to a handful of iconic John Hughes moments, as well as various references to the stereotypical ways in which teen movies generally resolve their problems. Olive declares that since it’s her story, she wants her random, unrelated musical number a la Ferris Bueller; wants Lloyd Dobler standing outside her window with a boom box; wants to go riding off on the back of Patrick Dempsey’s lawnmower like in Can’t Buy Me Love. And of course she does, because, didn’t we all? I will say that these references seemed, in large part, to go over the heads of the teenagers in the audience at the showing I attended, but that’s their loss. Get out there and see The Breakfast Club, young ones! All in all, I would highly recommend this one for all of the reasons mentioned. Truly enjoyable, particularly if you are a fan of smart, fast, clever dialogue, Stanley Tucci (love. him.) and John Hughes. He’d be proud. **First things first, I would like to say that it is in extreme oversight that I left Mr. Paul Newman off of my list of individuals who “Used to be hot, [but are] sadly no longer with us.” My sincere apologies. 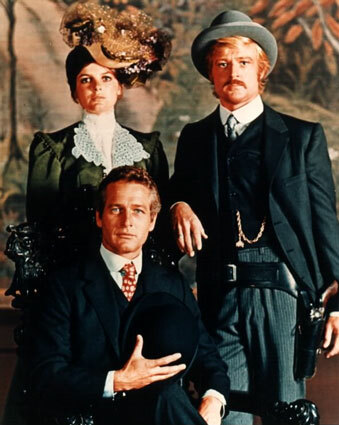 Butch Cassidy and the Sundance Kid is #50 on the 1998 AFI 100 Movies list. It looked fun, and stars Newman and Redford are such icons now that we have been looking forward to it. It skipped my mind at the time, too, but the screenplay was written by William Goldman, who is perhaps these days best known for writing The Princess Bride, so that’s another point in the movie’s favor. And for the most part, I would say that it does not disappoint; rather, I don’t think it’s quite what is expected, but that’s not really a bad thing, now, is it? Butch Cassidy (Newman, utterly charming) is the leader of a moderately successful group of bandits called the Hole in the Wall Gang. He is backed ably by The Sundance Kid (Robert Redford, silent), a gunslinger of renown. After a cleverly executed double-robbery of a train, Butch and Sundance find themselves inexorably tracked by a group of lawmen, and eventually go on the run to Bolivia, along with Sundance’s lady-love, Etta (Katharine Ross, stoic). While in Bolivia, they make a new name for themselves as the Bandidos Yanquis, but they seem to know that their time-and the time of the outlaw-is running out. The theme of this Western is very similar to the of Peckinpah’s The Wild Bunch (also 1969, #80 on the AFI list), that of progress in the West and the end of the age of the outlaw, but the treatment is markedly different. Peckinpah’s ensemble piece is gritty and graphic, whereas BC&TSK is most often light-hearted, humorous, and surprisingly picturesque. It feels a little dated, honestly, what with the Burt Bacharach score and one or two scenes (most notably a lovely montage of Butch and Etta on a bicycle, the “vehicle of the future”), but the point is still made and the result is largely the same as that of most Westerns…by which I mean that it doesn’t have a happy ending. The marked difference for us between this film and most of the previous Westerns was the fact that we actually grew to care about the main characters, thus making their eventual end all the more depressing. It’s not hard. Newman is at his boyish best as the irrepressible Cassidy, a “thinker” who, despite having been a robber for many years, never seems to have any money. He’s the most charismatic and likable outlaw you’ve ever seen. Redford is the straight man to Newman’s gentle jokester, but is no less charming, if a bit more ambiguous, a la a “true” outlaw. The dialogue is fantastically quick and witty, with zingy one-liners waiting around every corner. Katharine Ross’s Etta is subtly understated, but she provides the heart of the piece, reminding us of the realities of an outlaw’s existence, that of an inescapably bloody end. The three have an easy camaraderie, which also serves to make the realities more poignant. The film becomes slightly more serious as it moves along, even as the wit becomes broader. Both Butch and Sundance use humor and sarcasm to cover up their understanding of their positions. They’re getting older, the world is moving on without them, and they seem to know that they’re going to eventually have to decide whether or not to go out in a blaze of glory. It makes them surprisingly vulnerable, and it makes the movie much more resonant. Our complaint with most of the Westerns (notably: Unforgiven, The Searchers, and The Wild Bunch) is the characters are so seldom likable. Perhaps, though, that’s the right idea, because that way, when the movie reaches its inevitable end, you’re not left feeling as though you’ve lost friends. Butch and Sundance are really great characters who, despite their transgressions, would seem to deserve better, but I suppose it you live like an outlaw, you’ve got to go out like one, too, guns blazing. All in all, an enjoyable film, that I would definitely recommend to anyone, unless you’re not big on lots of shooting. Onward to Snow White & the Seven Dwarves! How’s that for a 180?? TGIF, folks! Here are things of import at Banana Oil Movies HQ on a rainy Friday morning. 1. New trailer for Due Date. Sigh. Words cannot express how absolutely hot I think RDJ appears to be here … but nor can they express the extent to which I have no desire to watch this movie. I have yet to laugh at either of the trailers (I blame my distaste of the “current brand of humor”), and, well, I didn’t enjoy Planes, Trains, and Automobiles the first time, so why should I watch it again? Searing hotness or no searing hotness. 2. File under WTF? News: Russell Crowe is supposedly going to be starring [?] in The Man with the Iron Fist, a kung fu film not based on the comic of the same name, to be directed by RZA from the Wu Tang Clan, who will also have a starring role. Ummm…kay? I can only guess that Crowe is trying to appeal to a broader fanbase, and/or doing a mate (RZA was apparently in both American Gangster and the upcoming The Next Three Days) a solid. All that’s being said about Crowe’s role in the film is that he will be “the baddest man ever”. In thinking about this, maybe he will be making another foray into villainhood? That would have the potential to make me extremely happy, as I think he’s a marvelous bad guy. Except for that whole kung fu thing. Or something. I don’t know. V. confused by this whole story. 3. Some decent-looking fare is hitting theaters this weekend: Affleck’s The Town (gritty, Boston-based ensemble drama), Never Let Me Go (Mulligan, Knightley, and Garfield as doomed [?] young people in a dystopian world), and Easy A (The Scarlet Letter gets the Clueless treatment). My pick? Easy A. Might not necessarily go see it, as I am still waffling. It’s getting middling reviews, but it’s got Stanley Tucci! And Lisa Kudrow! And Stanley Tucci! Other than that, I just sent back a Netflix offering today, so probably won’t get to anything else over the weekend. Might catch up on some *gasp* reading instead. Will you be seeing any of the new releases? Happy viewing! On this Monday, I would like to register a wish for some interesting movie-related news. I don’t give a darn about Noomi Rapace being cast as “a French gypsy” in Sherlock 2 … don’t have a whole lot of love/excitement for Sherlock 2 across the board (aside from a general interest in its pretty, pretty star) although I would like to know who’s playing Moriarty. IMDb still has DDL listed. But I guess this is just the slow movie season; the calm before the awards season storm. We didn’t get to Butch Cassidy this weekend, but we did watch a movie. I don’t have a whole lot to say about it, but since I said I was going to try to do more reviewing, I’ll go with a few impressions. A mini-review, if you will. We watched Scoop, which is a Woody Allen film starring Scarlett Johansson and Hugh Jackman. See, Scarlett is on the husband’s List, and so every now and then she pops up in the old Netflix queue, even though we’ve pretty much decided that she’s not really that much of an actress. Still, I was moderately curious about the film, so down I sat. This despite my dislike of Hugh Jackman. Yes, I know, he’s sooo pretty, and he sings! And dances! And he’s Wolverine! Enh. His looks don’t do it for me. I just find him smarmy. Except as Wolverine, obviously, but I am just not a Wolverine fan (there is not really anything hot about a very hairy, very grouchy man. Seriously, if your honey generally behaved like Wolvie, you would not be swooning). I do, however, think he’s a decent actor some of the time. See: The Prestige. He’s much, much better in that. The plot of Scoop is that a well-respected journalist (Ian McShane, funny), upon dying, gains insider information into the possible identity of a serial killer, and cheats death in order to gift this scoop to a journalist in the land of the living. For reasons unexplained, he gets connected with Sonya Pransky, an American journalism student (ScarJo, weird) who is in the middle of being “disappeared” onstage by flaky magician Sid (Allen, obnoxious and dare I say, unnecessary?). The scoop is that the Tarot Card Killer may be Peter Lyman, handsome businessman and aristocrat (Jackman, smarmy). Sonya and Sid decide to investigate, with Sonya ending up in a relationship with Peter, while Sid masquerades as her father. Hilarity ensues? There’s a little bit of a plot twist, and that’s pretty much it. Alright. I don’t get Woody Allen. I haven’t seen any of the movies from his heydey, (Annie Hall is way up on the AFI list, and I am sort of looking forward to it) but I kind of think that they must have been a whole lot better than his more recent stuff, which is pretty unimpressive. I liked Vicky Cristina Barcelona, though, and I think the reason why (aside from Bardem & Cruz being awesome) is that Allen himself was not in it. Seriously, the neurotic Jewish schtick, exemplied by non-stop patter? Not funny: annoying. And in Scoop, he sort of has ScarJo emulating that brand of humor, which was weird. I do think she did a decent job of it, but it didn’t look comfortable. I thought the plot and the performances (Johansson, McShane, Jackman [except for the denouement]) were fine, but that the whole thing would have been better in the hands of someone other than Woody Allen. Is that sacrilegious? I will reserve judgment on Allen in general for now, not having seen his “masterpiece” but after a couple of his more recent movies, I am not impressed. At least in this one (as opposed to The Curse of the Jade Scorpion, v. similar) he didn’t get the girl. That would just be beyond creepy, his actual personal life aside. Bottom line, I don’t recommend Scoop, unless you just want to look at Hugh Jackman being “charming” for a hour and a half. Johansson is not remotely her usual va-va-voom self in this one, so there’s not even that much in the way of feminine eye candy. Check out Vicky Cristina Barcelona instead. Johansson is slightly less wooden, and is more than made up for by Penelope Cruz, Javier Bardem, and Rebecca Hall. And there’s no Woody Allen to gum up the works. Project: AFI 100 Films–Halfway there! Since then, we have gotten married, graduated from grad school, moved from the Midwest to the West Coast to the East Coast, held a variety of library jobs, and are now preparing to become parents. All of that is by way of offering some slight explanation as to why we are just now reaching the halfway point. Admittedly, we have not watched “List” movies to the exclusion of all others, either. And sometimes, with a selection we weren’t looking forward to, we have been known to drag our feet. I think the record for that was about 2 months. Lately, though, due in part to my starting this blog and also to the offerings getting better all the time, we’ve gained some ground. And so, over the weekend, we watched #51, which I have been looking forward to since we started, and will most likely kick off the second half this weekend sometime. By way of retrospective, I (with assistance from my partner in movie-viewing crime) have selected a “top 10” from numbers 100 to 51. These are movies we really loved or were surprised by. I will also point out that only one of them, I think, is one that both of us had seen before tackling the list. Admittedly, our favorites skew heavily toward comedies and musicals, but hey! We’re generally happy, musically inclined people, and we go with what works. Anyway. All of these movies come highly recommended. Four thumbs up! #97-Bringing Up Baby (1938): Delicious, screwball lunacy starring Katharine Hepburn and Cary Grant. How can you go wrong? I know everyone thinks of Grant as being the picture of suave urbanity, but let me tell you something: the man is funny. #93-The Apartment (1960): Shirley MacLaine, Jack Lemmon, and Fred MacMurray are all riveting in this smart, snappy, semi-dark comedy. We knew nothing about this one beforehand, and it became an immediate favorite. #82-Giant (1956): We were convinced that this epic drama would be, well, boring. Instead, it is superbly acted and utterly watchable, largely due to the sweeping cinematography and the impressive aging through which the cast goes during the course of film. Liz Taylor is a revelation, and James Dean (in his last role) gives us taste of the greatness lost as a result of his early demise. #81-Modern Times (1936): The “first” of three Chaplin films on the list, Modern Times is a really incredible and brilliant satiric commentary on industry, all wrapped up in the guise of the Little Tramp, bumbling through a series of misadventures. This was our first Chaplin film, and while husband would go on to prefer City Lights, I just don’t see how it gets any better than this. #68-An American in Paris (1951): You may already be aware that Gene Kelly is my absolute, all-time favorite movie star. And yet, I have a confession to make. Up to about a year ago (I think), I had never seen this movie. I had seen multiple times the clip of the final-act ballet, and I mistakenly thought that the whole movie was the same, which I thought would be really boring. I owe Mr. Kelly (along with Leslie Caron and Oscar Levant) a serious apology. In a word? Fan-Freaking-Tastic. I’m pretty sure I was grinning from ear to ear the whole time. Gene Kelly…is just the best that ever was. I’m gonna stop now. You need to see it. #67-The Manchurian Candidate (1962): Much has been made of Angela Lansbury’s fabulously evil mother in this political thriller, and she did not disappoint. Neither did Laurence Harvey in the lead role, and I was personally surprised to note Sinatra’s solid dramatic turn as well. Intense, and really enjoyable to watch. #63-Stagecoach (1939): Once again, our expectations for this movie were not very high (despite its inclusion on the list in the first place), but we were pleasantly surprised. A strong ensemble cast, including John Wayne (arguably in his prime), along with excellent cinematography and a nice, uncluttered story and script, make this Western one of the few (5 so far) that we have really enjoyed. #56-M*A*S*H (1970): I think I have mentioned this one previously, as one of the best movies I’ve seen this year. Here’s what I said: It’s a classic. I tend to dread war movies a little, but I was surprised by how darkly funny this one is. Strongly recommend, if you haven’t seen it. Not much to add to that. The ensemble cast, led by Donald Sutherland (surprisingly charming) and Elliott Gould, is strong all the way through. I don’t always get what Robert Altman is about, but when he is good, he is very, very good indeed. #55-The Sound of Music (1965): Please. Who doesn’t love this movie? It’s Julie freaking Andrews, people. And Christopher Plummer! And the scenery! And the music, and the kids, and…yeah. Obviously, we’d both seen this one before, but this time around I was struck by how it is consistently enjoyable (despite having seen it upwards of 20 times), and by how much there is always to notice. It’s a much-loved classic, yes, but it’s also a very well-crafted movie. #51-The Philadelphia Story (1940): Oh, number 51! This is the one I had been looking forward to from the start. I was a recent initiate into the works of Cary Grant and Katharine Hepburn, and after Bringing Up Baby, I just knew this one had to be a winner. A wonderful, fast-paced comedy (I will need to see it again at some point to catch things I missed), everyone is utterly spot-on, and adding James Stewart to the powerful one-two of Grant and Hepburn is nothing short of inspired. Husband had seen it before, and kept downplaying it for fear that my high expectations would be disappointed. He needn’t have worried. Another one that had me grinning from start to finish. And so, on to the next 50! We’re both looking forward to Butch Cassidy and the Sundance Kid, and to many more before we’re done. I’ve seen all but three of the top 10, so I’m expecting those to be really fabulous. Hopefully, I’ll still be around to recap again in another 5 years, or however long it takes us to reach the end. I think going forward I may review things as I watch them, so stay tuned!! PS. Consider this your weekend viewing post. You’ve got more than enough Banana Oil-approved movies here to keep you busy for a month of weekends, at least!